Seems to me realignment belongs to the aligners. I like where Novoalign is going with this. Thanks much for the thoughts. I think the ideal situation is to have more compatibility between alignment and variant calling to better account for tricky alignment decisions. It’s valuable to be able to realign and adjust reads taking ploidy and haplotypes into account. This could be further improved by having information from the aligner about alternative locations, allowing final assignment of reads based on local assembly and haplotype graphs instead of strict mapping. I’m following Heng Li’s work (https://github.com/lh3/fermi2) thinking it might move in this direction. Mappers treat each read independently, while both realigners and variant callers require sorted final alignment. In this sense, realigners are much closer to variant callers. It is definitely not mappers’ responsibility to do realignment. great post Brad, really appreciate the effort you put in these posts, and in the bcbio pipelines. Have you done any more systematic investigations into the cause of the discordancies? any obvious trends with DP, GQ, HRun or others? I’ve done a lot of digging into this and we’re working on a visualization system called o8 to identify useful discriminatory metrics (https://github.com/chapmanb/o8). The short answer is that it’s not obvious and the current variants callers and filters do a great job of catching the known problems and avoiding them. The most useful distinction is coverage depth, where calls with low depth (<13; http://www.ncbi.nlm.nih.gov/pubmed/23773188) are more difficult to resolve. The other currently target we look in assessing quality is strand bias, especially where a heterozygous call has additional quality support on one strand and not the other. But it's definitely a bit of a research project so we have ideas of what to look at right now more than specific recommendations. Thanks much for the feedback and thoughts. Great analysis. Do you know which version of freebayes improved its performance: I have this v9.9.2-13-gad718f9-dirty. Is this recent enough? 9.9.2-13 is the version with the detection improvements, so it should show a lot of the benefits. It would be worth upgrading to the latest only because there were a few round of bug fixes for edge cases, so this would help avoid some of the error regions that -13 has. The lastest is -19. Hope this helps. thank you for the info. i will update it. I was at BC and know G.M. so it good to hear FB is getting better. Do you think a Galaxy based visualisation solution will be more accessible? I am working on something similar. For some reason, I am not able to comment via G+. I’d definitely like to integrate this pipeline into Galaxy and was hoping to put together a proof of concept as a CloudMan shared instance. It would be great to make running the pipeline and analyzing results more accessible so I’d be happy to explore integrating with your visualization tools once they’re available. Thanks much for the interest in this. Could you please let me know the filters based on depth, quality and strand bias that you used for freebayes? Definitely. We use both a very vanilla filter with only depth and quality (QUAL < 20, DP < 5; https://github.com/chapmanb/bcbio-nextgen/blob/master/bcbio/variation/vfilter.py#L72) and also have been experimenting with a more complicated filter that filters hets/homs differently and considers strand quality. This is part of bcbio.variation, with the algorithm here (https://github.com/chapmanb/bcbio.variation/blob/master/src/bcbio/variation/filter/custom.clj#L7) and the commandline call here (https://github.com/chapmanb/bcbio-nextgen/blob/master/bcbio/variation/vfilter.py#L63). I'm not convinced the more complex filter is currently worth it, which is why I underemphasized it in the post. I was working on filtering approaches at the same time FreeBayes improved calling approaches, and the calling approaches were far and away the bigger improvement. I hope to examine this further with the new FreeBayes updates and categorize what value it provides. An interesting exploration would be to look at the ROC curves of various callers rather than just at a fixed threshold. Presumably, different cutoffs might show that one caller can be more specific than the other, or more sensitive. Possibly one method has an overall higher area under the curve (AUC)? Thanks for the heads up. I’ll definitely investigate sambamba more. It would be worth emphasizing the current version and changes on your GitHub README and wiki page. I actually looked at sambamba a month ago and didn’t realize you’d added parameters to control core usage in recent versions (I had CloudBioLinux’s 0.2.9 on my machine). I’ll update to the latest and work more on it. Thanks again. Thanks for this- this is really useful. I was wondering if any work had been done in comparisons for these callers for low coverage data. Presumably, as calling of low-coverage data can have different problems, the ranking of the callers from high coverage data may not be generalisable to this? Great point. 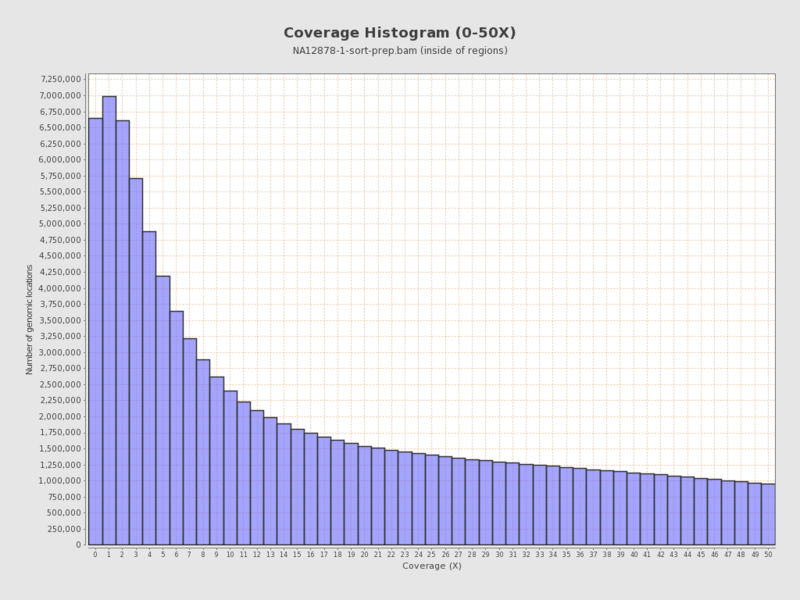 This is a moderate coverage library (40-50x in exome regions). Here’s the binned coverage (http://i.imgur.com/mz2v3oA.png) and 0-50x coverage (http://i.imgur.com/yfXHUTg.png) in the target regions. 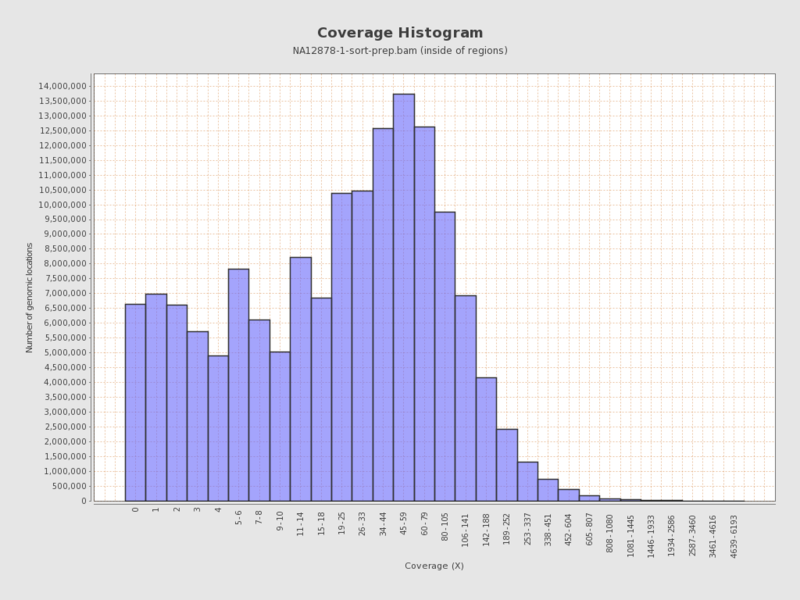 As you mention, low coverage regions are definitely the hardest to resolve. The previous post (https://bcbio.wordpress.com/2013/05/06/framework-for-evaluating-variant-detection-methods-comparison-of-aligners-and-callers/) explicitly enumerates some of these challenges and provides numbers specifically in low coverage (< 10x in that post) regions. It would be interesting to downsample and repeat the comparisons to see how the results change depending on inputs. Thanks for the useful feedback. Hi Brad, thanks for the analysis. I am really interested in this and are trying to perform similar comparison between GATK, Freebayes and also ISAAC (although I still have difficulties getting ISAAC to run…), how do you use Freebayes when performing the calling? It seems like instead of having the realignment implemented within Freebayes, the author suggest the use of samtools fillmd, so did you perform the analysis by comparing the situation where Freebayes is used with samtools fillmd and without samtools fillmd? This is absolutely correct. My apologies for the confusion in the documentation. I provide examples of how to stream various utilities together for time-of-flight BAM processing. At present, the optimal way to use freebayes is by specifying only the reference and set of BAM files. In freebayes, left realignment is done internally on a read-independent basis. You no longer need to use bamleftalign or any other independent realignment process. If you want to see what kind of effect the process has an option is provided to turn off the automatic realignment. The realignment is quite fast, using only a few percent of runtime, and in practice achieves identical performance to much more complicated methods. freebayes also always calls all short sequence variants together. The model is agnostic as to allele type at the point of detection, using only literal haplotypes observed in the reads. At times we describe it as the most local reference-free method— it is reference-free only within a dynamically-bounded window anchored by reference-matching reads. Many users are interested in turning off specific allele classes. I think that this is not a good idea to do in the detection phase, as errors can manifest as any allele type within alignments, and ignoring them may cause the caller to be overconfident at relatively noisy loci. Hope this clarifies things. I’m doing what I can to produce a system that is both user friendly in the default case and powerful when users have specific needs or unique experimental contexts. I’m writing up examples of both simple and complex use cases for a rewrite of the documentation, so please let me know off-thread if you have an specific questions or confusion. Erik, thank you for your answer, I will now proceeds to try the pipeline, hopefully I can come back to you guys with the results soon. @Sam — there isn’t much of a pipeline as freebayes is concerned. Just run freebayes on your alignments (in BAM format) and you’ll get a VCF, freebayes -f ref.fa file.bam >out.vcf. 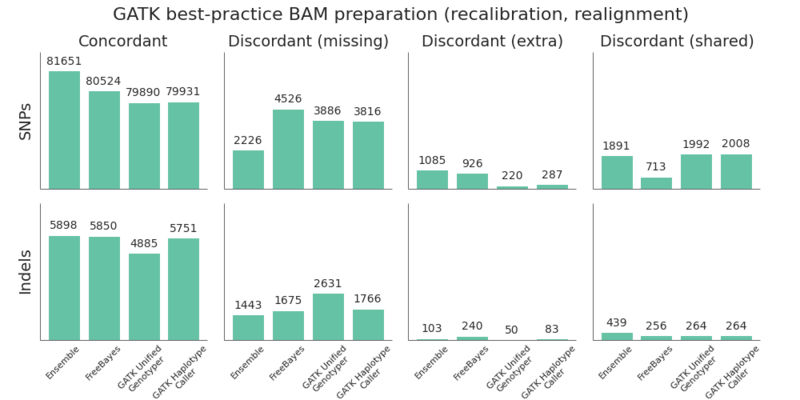 freebayes has a lot of options, and can be used in many different contexts and processing patterns, but if you are working on diploids the best way to use it is to just run with the reference (-f) and a set of BAM files. I don’t really see the various base quality recalibrations and dbSNP-aware indel realignment has having much benefit. The algorithm internally implements left realignment. I second your saying, at least on high-coverage data. I used to compare the samtools calls on a very old data set with and without GATK base recalibration. Samtools worked a little better without recalibration. I also think realignment should be fast without a candidate list, at least faster than the BAQ calculation. We are simply lacking a good realigner implementation. Heng, the left-realignment implementation in freebayes is also factored into an independent executable (bamleftalign). See https://github.com/ekg/freebayes/blob/master/src/bamleftalign.cpp. I’d be happy for someone to show how this doesn’t work as well as a candidate-list based method for the newer variant detectors. For the local assembly or haplotype-based methods, the crucial thing is to get enough evidence in consistent representation to trigger consideration of the locus. Read-independent left-realignment provides this at only a few % of variant calling runtime. With the detection method in freebayes, clusters of multiply-aligned indels will typically result in haplotype calls across the inconsistently-represented region. Within these calls the exact representation of the alignment doesn’t matter. Genotype likelihoods are based on comparison of the read sequences and alternates, which handles the cases that might not be dealt with via read-independent left-realignment. Thanks for the post. Do you have a finer breakdown of the timings for each step of the Exome analysis ? It would be interesting to note the performance bottlenecks along with the variant concordance. I’m planning on updating that based on the new pipelines but haven’t started writing that up yet. Hope the previous post helps. Would it be possible to get the exact commands used for Freebayes in these tests? Thanks. I recommend just using freebayes -f $ref >out.vcf for diploid data. –ploidy 2 is default. –pvar 0.7 may reduce sensitivity. And, the docs should reflect this, but –use-mapping-quality has no effect unless –standard-gls is also specified. Brad, it’d be interesting if –pvar 0.7 improves performance over default. To clarify further, mapping quality is accounted for by default now, using the “effective base depth” quantity developed by the developers of snpTools at Baylor College of Medicine. Thanks for the heads up on the mapping quality change. This was added based on recommendations a year and a half ago (https://github.com/chapmanb/bcbio-nextgen/commit/680ebb3694765e945f0008471aea39edfb0136d7#diff-f56264ae93605f9df25e111b3d08512c) and I hadn’t realized it was no longer needed. It’s removed now to make the usage more vanilla. I use the –pvar flag to avoid variant calls with extremely low quality values (much smaller than 1). Some of these were so low they caused GATK post-processing to error out, which necessitated the flag. Since these were all getting filtered based on quality anyways, I set it to avoid losing sensitivity. I could try and put together a reproducible case of the extremely low values if it would be helpful. As always, this is great work. There’s one piece, though, that I’d like to focus on that I think needs improvement and it would be good to garner feedback from the community. Your analysis above showing the “shared discordant” numbers uses hard genotype (GT) calls, which is really not the right thing to do; all downstream analysis of the VCF that includes genotypes really should be based on likelihoods. The GATK team is just starting to put together some documentation and best practices on this, but I’ll give a quick summary here. Ultimately, what you want to see is how well calibrated the genotype likelihoods are; you can use the GQ (genotype quality) as a value for how confident the caller is in the genotype assignment. The question is how well that confidence matches to the real truth. So we actually expect 1 in 10 GTs with a GQ=10 to be incorrect (and anything off from that ratio is a mis-calibration). An incorrect GT with a high GQ is very bad (the caller was very confident in the wrong genotype) but an incorrect GT with a low confidence is within expectations. I took a look at the VCF you released with the common sites of discordant genotypes. For the 38 records on chromosome 20 with GQ annotated, 25 (66%) of them have extremely low GQ (< Q20). These are generally sites with relatively low coverage and 1-2 sequencing errors and the likelihoods accurately reflect this. So my question is: how should we (the GATK) communicate such cases to users in the VCFs we output? Currently, we greedily assign genotypes (GT) based on the likelihoods and assume that users will appropriately ignore those with low GQ. But clearly we need to take a more pro-active approach in cases where we know that a sample has the variant allele but where we have low confidence in the actual genotype (0/1 or 1/1). Should we assign such samples a GT of ./1? What do folks think? Thanks for all this great feedback. I’m agreed that using likelihoods to stratify discordants into ‘well supported’ and ‘the caller was not sure’ would be a nice way to classify if callers have differing het/hom calls based on caller errors or low evidence. I’ll think of ways to incorporate this into future comparisons. On the other side, I do think it’s too simplistic to say that we should look at everything in terms of likelihoods. When reporting variants and using most downstream tools we practically need to translate the likelihoods into absolutes and report genotypes based on the caller’s best assessment. So we need to develop good ways to flatten the continuous likelihoods into something that’s easy to translate to end users. It would be useful to have variant calls supplemented with categorical classifications so you could more readily assess the reliability of a call. An INFO annotation or associated BED file that classifies a region as callable, non-callable or maybe would be a big help. Folks could decide whether to include ‘maybe’ calls and associated higher false positive rates. This might only be a documentation/perception issue and be as easy as saying that all calls with ‘GT < Q20' are less reliable and provide recommended practices for dealing with them based on desired risk of false positives. My view is that variant calls should come alongside ways to assess and report coverage and likelihood by region. Right now there are numerous tools to prioritize calls based on the experiment, but not to identify if important regions got missed, or are of low quality so might be wrong. Chanjo (https://github.com/robinandeer/chanjo) does a nice job of this and it would be useful to combine variant quality metrics alongside coverage. Could you point me to the hard filters you were using for freebayes? Thanks. (1) The Freebayes false positive rate seems significantly higher than the GATK FPR. I am curious what the sensitivity comparison looks like if the 3 callers were tuned for similar FPR. (2) What was the total region size analyzed? i.e. did you use any of the GIB confidence-based region filters? they have BED filters for regions with known structural variation, etc. Thanks much for the thoughts and questions. 1. The FreeBayes potential false positive counts are slightly higher than GATK HaplotypeCaller (913 versus 325 for SNPs; 228 versus 83 for Indels). However, one cavaet is that the preparation of the Genome in a Bottle reference makes heavy use of GATK HaplotypeCaller so these materials have some likely biases towards the GATK tools. The general notion is that many of these FreeBayes calls may be true calls that are missing from the reference. I’ve sent these off to Justin Zook at NIST and he’s evaluating if any of this may be helpful for improving the GiaB reference to be more unbiased. 2. The total region size is 117 million bases. This is 78% of the total capture regions for the exome (150 million). The subsetting is two things: we only include callable regions from the actual exome data (4 or more reads aligned) and then by the Genome in a Bottle BED file. So it does avoid the known structural variations and difficult regions that GiaB also excludes. Will be interesting to see what Justin Zook concludes, and that certainly is a reasonable (or maybe even likely) hypothesis. However, seems also plausible that GATK could achieve the Freebayes sensitivity level if tuned to allow 3X more false positives through. Also, thanks very much for providing the analysis region size – this allows us to compare your Freebayes FPR of about 10 per Mb to other published reports and benchmarks. Again, super nice post! Did they ever publish FreeBayes, I can’t find the publication? ?